See Our "Signing of the Articles of Incorporation"
Check out "YouTube" channel !!! Now we need to work on growing the Club into an Organization that not only promotes the 2nd Amendment and the Safe use and Responsible Ownership of ALL Firearms but also an Organization that the Local Community can look to for direction and Leadership in all things related to Self Protection, Hunting, and Marksmanship in an effort to rekindle the fire of true Patriotism, Freedom and Liberty for All !!! on a 1 Year Membership! Consider that the sword was the finest offensive weapon available to an individual -- the equivalent then of a military rifle today. 1Timothy 5:8 commands us to protect ourselves and our families; Those who refuse have denied the faith and are worse than a nonbeliever. "Today, we need a nation of Minutemen, citizens who are not only prepared to take arms, but citizens who regard the preservation of freedom as the basic purpose of their daily life and who are willing to consciously work and sacrifice for that freedom. By calling attention to 'a well regulated militia,' the 'security' of the nation, and the right of each citizen 'to keep and bear arms,' our founding fathers recognized the essentially civilian nature of our economy. 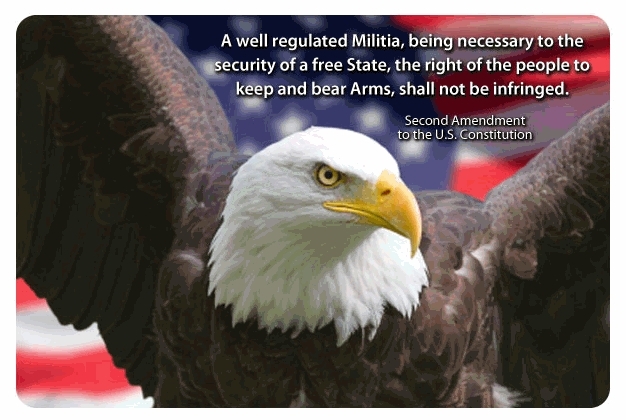 Although it is extremely unlikely that the fears of governmental tyranny, which gave rise to the Second Amendment, will ever be a major danger to our nation, the Amendment still remains an important declaration of our basic civilian-military relationships, in which every citizen must be ready to participate in the defense of his country. For that reason I believe the Second Amendment will always be important." “Among the many misdeeds of the British rule in India, history will look upon the Act depriving a whole nation of arms, as the blackest." "Those who have the command of the arms in a country are masters of the state, and have it in their power to make what revolutions they please. [Thus,] there is no end to observations on the difference between the measures likely to be pursued by a minister backed by a standing army, and those of a court awed by the fear of an armed people." “The totalitarian states can do great things, but there is one thing they cannot do: they cannot give the factory-worker a rifle and tell him to take it home and keep it in his bedroom. That rifle, hanging on the wall of the working-class flat or laborer’s cottage, is the symbol of democracy. It is our job to see that it stays there." "Certainly one of the chief guarantees of freedom under any government, no matter how popular and respected, is the right of citizens to keep and bear arms.... The right of citizens to bear arms is just one guarantee against arbitrary government, one more safeguard against tyranny... "
Matthew T. Oakey is an NRA Certified Instructor & NRA Life Member with a combined Two Decades of Training, and Military experience. Matthew is a "Traveling Instructor" - which means he works on your schedule!!! Two separate NRA courses are presented, one test administered, Notary Service. A Florida CCW Concealed Carry License is honored in 41 States as of 12 July 2014 !! !